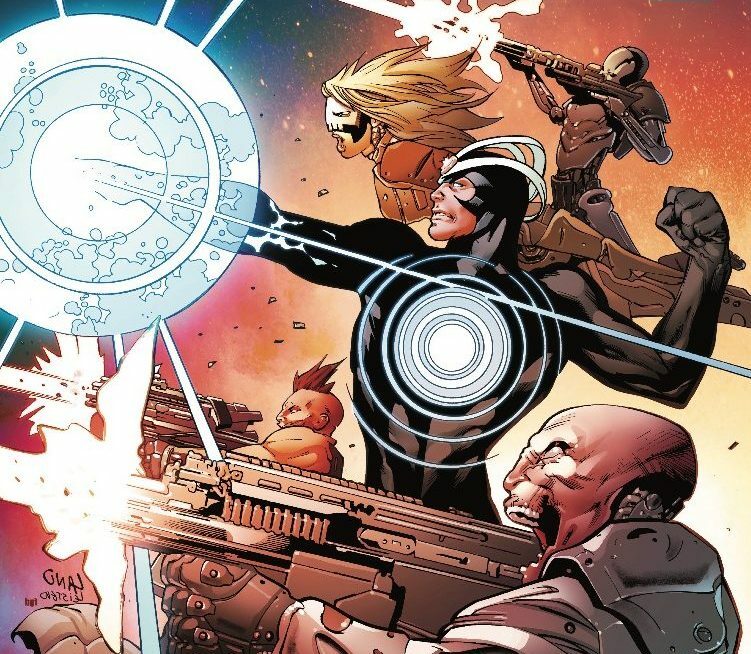 Astonishing X-Men # 16 Review: The enemy of my enemy – AiPT! Astonishing #16 continues this trend of high-adventure and slide jokes effectively. Since taking over Astonishing X-Men with issue #13, Matthew Rosenberg has brought a variety of themes to the book. Two of the most noticeable are fast paced action and a strong sense of humor. Astonishing X-Men # 16 continues this trend of high adventure and sly jokes effectively. Rosenberg really has a feel for the team that he is writing about. The issue is filled with sarcastic comments and even silly jokes, but they are never forced. Instead of shoehorning his comedy, Rosenberg simply plays off situations. This is par for the course for Astonishing, however it still makes for an effortlessly funny book that all readers can appreciate. And make no mistake about it, this issue is filled with action. There are fight scenes, daring escapes, and large scale battles that one would expect from a comic with X-Men in the title. The entire issue is almost one continuous battle. Once again the story flows smoothly, making sure the ever present action never seems like too much. The laughs definitely bring a freshness to the book, however the action is up to par with any mutant title. Artist Greg Land does the best work of his run here. The art in the issue is absolutely stunning. Warpath, in particular has never looked better. Havoc continues to have the look of a bemused leader who may be in over his head. Most noticeably, Land has done great work with Dazzler since she has joined the makeshift team. There is a great single page battle scene involving Allison that may be the best drawn page since Land joined the creative team. Along with making Dazzler look more heroic than she ever has, Land shows off his talents in the issue’s many battle scenes. The fights take on a momentous feel that draw the readers in and the art fits perfectly into an X-Men book. There is also a gruesome moment involving the Reavers attempting to get secrets out of Havok’s head. Land also does his part to contribute to Astonishing”s humor. Many times in the issue, Havok has a sly grin on his face that adds to the issue’s amusement. The characters never have a fourth wall breaking smile that ruins the reader’s immersion, however. Much like Rosenberg’s writing, Land’s art is able to add laughs without sacrificing any of the gravity of the story. Astonishing X-Men #16 is another great issue in the short run of Matthew Rosenberg and Greg Land. The issue is filled with the trademark action and genuine humor that is already expected from the two. The next issue concludes the Reavers storyline and it is exciting to see where Rosenberg and Land are taking the team. Non stop action and humor highlight another great issue of the Rosenberg and Land run. The book is fun while never loving the quintessential 'X-Men' tone.